Your bath is an integral part of your bathroom, so it is important to make the right choice. A new bath is an investment, so you need to ensure it looks right and fulfils your practical needs. So how do you know which bath to choose? Before choosing your bath, you need to consider the size and shape of your bathroom. It’s easy to fall in love with a beautiful freestanding roll top bath but will it fit well in your bathroom? Will it compliment the layout you have? You need to work within the existing space, although a bathroom designer can provide ideas on how to improve the configuration. A bath is now not just a practical item, it can be the centrepiece of a statement bathroom or a welcome haven to relax in, in a busy family home. Some people like to have a long soak in the bath every night, other people prefer showers but like the option of a bath occasionally. For bath lovers a deep, luxury tub may be the answer whilst for occasional use a shower/bath may be a better option. 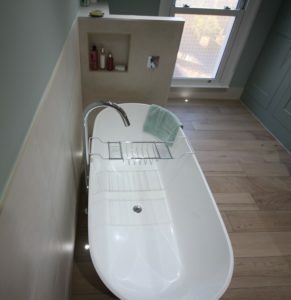 If your bath is used mainly for family bath time, then a practical bath will be needed. Is a freestanding bath right for me? Freestanding baths can make a real impact and can look great with a contemporary or traditional feel. They can take centre page and give your bathroom a sense of luxury and indulgence. For a freestanding bath your bathroom generally needs to be a good size. They are usually the most expensive option, with high end baths made of volcanic limestone costing in the region of £3000. However, if you love to soak then it could be a worthwhile investment. A shower bath is seen as a great compromise if you want a shower but also have the option to take a bath sometimes. This is often a great solution for smaller bathrooms where there’s no room for a separate bath and shower cubicle. The advantage of this solution is you can create extra space at the shower end, but this does mean you have to use a curved bath panel and curved bath screen, which whilst scores high for practicality, scores low for aesthetics. Do I just need a standard bath? In the majority of my designs I prefer to use a standard shaped bath, the reinforced version for shower use. This enables the client to be more flexible with their choices. You can choose between a shower curtain or a bath screen with a single, double or triple panel. The bath panel can also be covered in your chosen tile or other matching materials and extra design features can be introduced with bath panel ledges and the use of LED strip lighting within the bath panel itself to create mood lighting. This can mean your bath fits in more seamlessly with your overall design. It is important to remember the practical considerations when choosing a bath. You need to think about what type of water system you have and where your drain and waste pipe are situated as this could impact your choice. For example if you have low or poor water pressure , avoid large freestanding baths, unless you are happy to start filling the bath in the morning, ready for your evening soak! Importantly, you need to consider the weight of the bath you have chosen. Not just the weight of the bath itself but how heavy it will be full of water and occupied! You must think about the amount of pressure put on the flooring and ensure your installers will secure the floor correctly. Lastly, you need to measure your bathroom door to ensure your new bath will fit through the entrance! We have a wide range of Projects showcased on the website displaying different baths and how they have been integrated info bathroom design. This is a great place to start if you are considering revamping your bathroom. We show details of each project and a price range. If you want to create a bathroom that looks great think about using our managed service. You get to avoid all the hassle and stress of a home improvement project, which is never easy if you already have a busy family life. You have the highest quality tradespeople working for you and you have the reassurance that after the job is finished, if anything goes wrong you can come to us to resolve any issues. Check out our latest Projects to view other bathrooms and wetrooms we have completed recently. If you would like to find out more about what we can offer do not hesitate to Contact Us. Time for a bathroom makeover? Call 07879 666221 today!